Oh summer produce, how I love thee! If you ask me, eating healthy in the summer is just plain easy because everything is so fresh and delicious. Today is this month’s Eat Seasonal post which I love (and hope you do too! 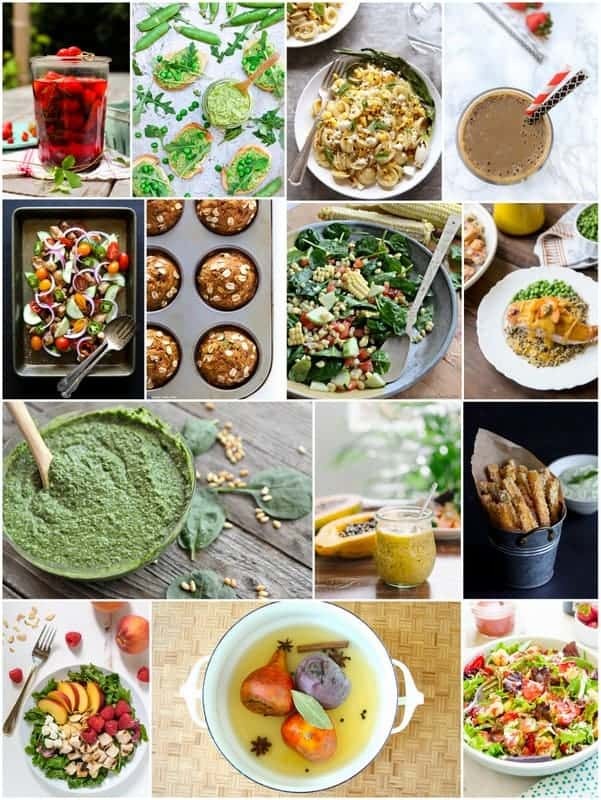 ), so sit back and enjoy a plethora of amazing looking seasonal dishes from some crazy talented bloggers. 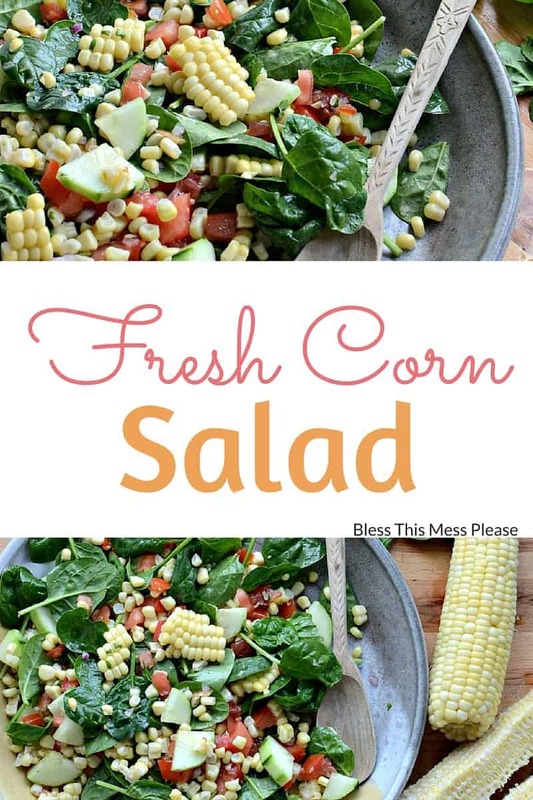 My recipe today is for Fresh Corn Salad. You will LOVE how easy this simple side is. Just mix a little honey and lime juice in the bottom of the bowl, add your veggies, toss in the spinach, season with a little salt and VOILA! You have a perfectly dressed salad and only one dirty bowl. Here’s a little secret. You can totally cook the corn right before you plan to make this, but you can also plan a little ahead and throw a few extra ears in when you are eating corn on the cob for dinner a day or two in advance. Having the corn cooked in the fridge and ready to toss in really makes things simple, though boiling a few ears that night isn’t a big deal either. Whatever makes you happy. You know how adding fruit to salad is delicious and adds a pleasant sweetness to things? The same idea applies to the corn here. 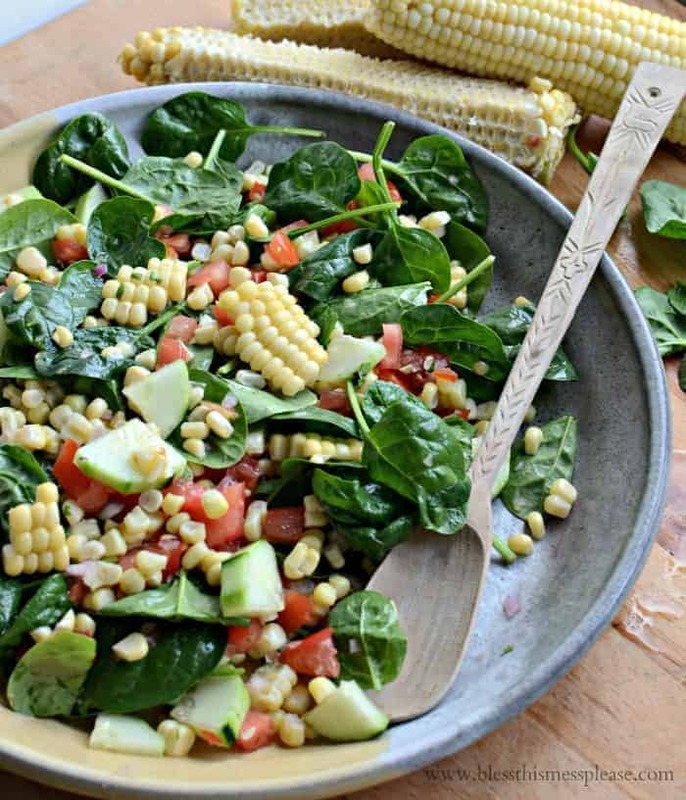 There’s something magical about the slightly crunchy and perfectly sweet little pops of corn in this salad. You will love it! 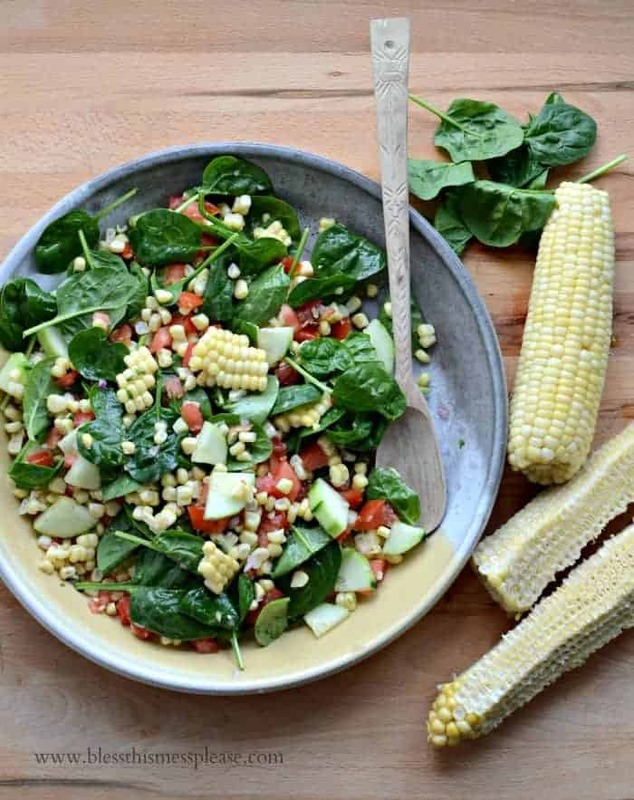 This fresh corn salad doesn’t make a bunch – I’d say it’s a side for four people. That’s a good thing though because it doesn’t keep very well if you do have leftovers. The spinach got yucky in the fridge overnight. Add a little bit of grilled Honey Lime Chicken breast though, and you’d have a great summer dinner for two that’s done in no time. And the best part of eating a light summer meal? You have room for some homemade ice cream once the dishes are done and the house has cooled off a bit. In a large bowl whisk together the lime juice and honey. Add the cilantro, jalapeno, and salt, whisk to combine. Cut the corn from the cob and add it to the dressing. Stir in the spinach, cucumber, and tomato. Serve right away or cover and chill for up to an hour. 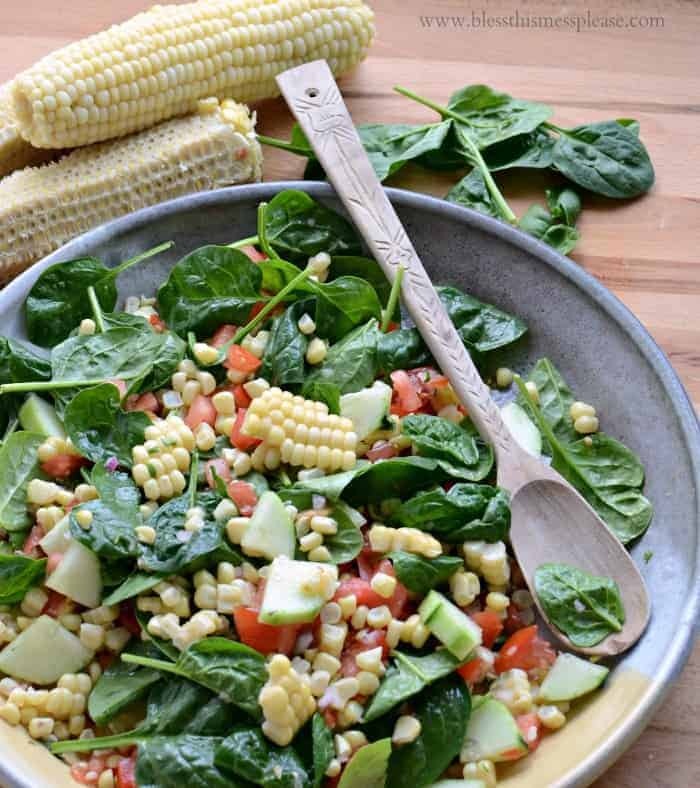 This fresh corn salad recipe was adapted from Better Homes and Gardens All-Time Favorites Volume 4, page 20. There’s so many recipes to love this month! I hope you take a minute to check them out. Those healthy zucchini muffins are on my to-try list! My plants have their first blossoms on them and I’ll be knee-deep in zucchini before you know it. I can’t wait! Thank you so much for stopping in and have a delicious day! This is EXACTLY how I like to eat in the summer. Simple and fresh. It’s too hot to cook or make a big fuss over lunch and dinner. Your dressing sounds awesome! Healthy eating is only easy in the summer if you don’t love ice cream like me 🙂 But yes to all of the cool salads and summer fruits!! Hope you are doing well with the baby coming soon! I will definitely be making this! Corn is by far my favorite vegetable and it is available fresh right now! Great minds think alike! I also like to cook a little extra corn each time I cook it so I can have some to throw into salads. I love the simplicity and freshness of this pretty salad!